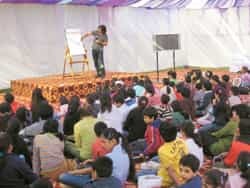 22 and 23 November: Around 3,000 children attend children’s literature festival Bookaroo in New Delhi. Two days of Bookaroo, India’s first ever literary festival for children in Delhi, put paid to doomsayers’ declarations about how little the little ones are reading. As children made a beeline for interactive storytelling, comic-making, illustrating and verse-writing sessions, or simply crowded the lone bookstall, it was clear that you could not ask for better readers. If your eyebrows are arching up and your mouth is an O, and there’s a little one by your side shooting little people into splats in a video game all day, it’s time for a quick, gratifying trip to the bookshop. This was the year when traditional myths and retellings were joined by a slew of self-help or life-skills books, such as the Berenstain Bears series for younger children and The 6 Most Important Decisions You’ll Ever Make and No Body’s Perfect for the teenagers. It was also the year that the children’s and young adult book market threw up quite a few exciting titles—and trends. The battle between a slick city vampire and a fire-breathing dragon spilled over from international shelves to those in India as Brisingr (Random House), the long-awaited third instalment (after Eragon and Eldest) of Christopher Paolini’s Inheritance Cycle series, arrived on the heels of the bestseller Breaking Dawn by Stephenie Meyer (Little, Brown Young Reader). With fascinating gothic books like Cirque Du Freak (HarperCollins) by Darren Shan and the Power of Five supernatural series by Anthony Horowitz, fantasy rose to the top of the charts, helped also by paperback releases of Percy Jackson and the Labyrinth by Rick Riordan (Puffin) and the seventh Harry Potter title. Teen spy thrillers and detective dramas sustained their star power with Robert Muchamore’s CHERUB series (Hodder Children’s), and the Artemis Fowl and Young Bond series (both Puffin). If chick-lit is filling up adult shelves, chick-let books for girls from Class III up are having a great outing, too. Take the glittery trail with the Rainbow Magic series by Daisy Meadows (Orchard Books) and Charmseekers series by Amy Tree (Orion); saunter over to palaces and hang out with princesses (Tiara Club series from Orchard and Meg Cabot’s Princess Diaries from Macmillan); give a high-five to pint-sized heroines (the Junie B. Jones and Judy Moody series); make friends with Cathy Cassidy’s many colourful protagonists; and, if you’re the guardian of a 13-plus, stop for a session with the Gossip Girls series (Cecily von Ziegesar) or Mary-Kate and Ashley Olsen’s teen queens. And, holding up all by himself in the boys’ corner—and equally popular with junior girls—is Horrid Henry (Orion), on his way to mischievous stardom. For local publishing, this was a year brimming with energy and variety. At one end of the spectrum, picture books for younger children seemed to find a place of their own. “I think Indian parents are finally appreciating picture books: It’s a change from the old view, which questioned the value of a book that has one line of text per page!" says Sayoni Basu, director, publishing, Scholastic India—a statement supported by the success of Tulika Books’ Ismat’s Eid by Fawzia Gilani Williams and illustrated by Proiti Roy; What Shall I Make? by Nandini Nayar and illustrated by Proiti Roy; and the collaborative Crocodile Tears by Sandhya Rao and Jonathan Lindstrom, and illustrated by Taufik Riaz. At the other end of the scale, Weed (Roli Books) by Paro Anand, the touching story of a Kashmiri boy’s struggle with loneliness, confusion and terrorism, found critical acclaim. The search for a good indigenous detective fiction series continues, and while the market was led by Scholastic’s The 39 Clues series by Rick Riordan, complete with an online game and trading cards, 2008 saw a start with Subhadra Sen Gupta’s Foxy Four mystery Double Click! (Young Zubaan), followed by Aniruddha Sen Gupta’s Fundoo 4 in The Mystery of MindNet (Scholastic). The hunger for children’s plays has hopefully been appeased for the moment by Five Plays for Children by Vijay Tendulkar (Scholastic), the first ever English translation of the playwright’s works for children, and Rigmarole and Other Plays (Puffin) by Sai Paranjpye. The year also saw “contemporary and urban" becoming the new area of experimentation in both fiction and non-fiction. Examples include the new Swapnalok Society series by Suchitra Krishnamoorthi—set in an apartment building with a cast of young modern characters—and exciting city histories in Talk of the Town by Jerry Pinto and Rahul Srivastava. “There has been a small but definite shift towards non-fiction," says Swati Roy, partner, Eureka!, a specialist children’s bookstore in New Delhi. Scoring with the kids are books such as The Magic Treehouse series (Random House), The Roman Mysteries series (Orion) and the Dead Famous and Horrible Histories series (both brought out by Scholastic). Two top-rated books, both from Random House, have been A Really Short History of Nearly Everything, the children’s adaptation of Bill Bryson’s bestseller, and George’s Secret Key to the Universe, in which Stephen Hawking and daughter Lucy explain the universe to readers of all ages wonderfully. If your child enjoys short stories, rejoice in the growing number of themed anthologies published this year, such as BeWitched, a collection of witch and wizard stories (Scholastic). Two books on animals are notable: Ranjit Lal’s rollicking story of displaced monkeys, leadership crises and hostages in The Simians of South Block and the Yum Yum Piglets (Roli Books) and The Rumbling Island: True Stories from the Forest of India, edited by Zai Whitaker (Puffin). And building upon the comic format, the Bones series (Scholastic) by Jeff Smith combined comedy and drama with remarkable illustrations. The latest Rowling, The Tales of Beedle the Bard, is the cherry on the year’s book gateau for young readers. Industry consensus would put down annual growth at a healthy 10-15% in children’s list sales over the past decade, and hope floats for the coming year of books for kids and teens. The momentum is building up and it looks like, finally, children’s publishers are beginning to scratch where it itches. Vatsala Kaul Banerjee is editorial director (children’s and reference books) at Hachette India, the newly set up arm of the UK publishing group.